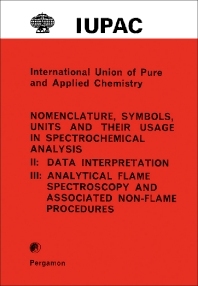 International Union of Pure and Applied Chemistry: Nomenclature, Symbols, Units and their Usage in Spectrochemical Analysis—III: Analytical Flame Spectroscopy and Associated Non-Flame Procedures covers the analytical application of flame spectroscopy and related procedures, which is not encompassed in the first two parts of the series. Parts I and II of the series deal with general recommendations. Section 1 of this document presents a classification of the methods and instruments used in the different branches of analytical flame spectroscopy. Section 2 lists terms and symbols for common quantities and constants in analytical spectroscopy. The subsequent section discusses the terms, symbols, and units for the description of the analytical flame spectrometer and similar devices. Section 4 explains the general terms and symbols relating to the methods of flame spectroscopy. The final section deals with the terms, symbols and units relating to optical radiation. This document is valuable to practical analysts who are looking for well-defined terminologies and consistent set of symbols in the field of analytical flame spectroscopy.